Congratulations, Mr. Klein! We are proud of your accomplishments as a member of the Houston Section and are very pleased to hear of your winning of the 2017 Otto C. Winzen Lifetime Achievement Award. Please look for an invitation in the coming months to also be recognized at our annual awards dinner in June. AIAA Houston wishes to congratulate Dr. John Valasek of Texas A&M University’s Aerospace Engineering Department on being named as a 2017 AIAA Fellow. 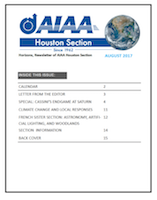 We appreciate your dedication to AIAA and are proud of your efforts in representing the Houston Section and the entire aerospace community.